Coastal North Carolina Trip – EHFC Members Talking! As many of you know, I just completed a trip to coastal North Carolina with my husband. This trip had been a long-standing goal of mine, and this blog post tells the story of how it all happened. Also, you can see all my photos from the trip here . My main goal in learning to fly was always to fly long cross-country trips to interesting destinations and see the country from the air. I flew a number of trips last summer, but I soon realized that without an instrument rating it would be hard to get very far, at least on any kind of schedule. So, I started instrument training, and I passed my checkride in late May of this year. My big 2013 trip destination was North Carolina, since my in-laws live in Wilmington. Plus with Kitty Hawk and the Outer Banks so close as well, it was clearly a desirable place to go. The original plan for the trip was to include both a coastal and a mountain portion – fly down the coast to Wilmington and perhaps even further to Savannah, then turn back west through Asheville, Knoxville and return on the west side of the mountains. I booked a plane for two weeks, and prepared the plan in some detail. It was interesting to discover what extra planning is required for a longer cross-country trip over what is needed for a simple overnight such as a weekend in Boston. I purchased paper VFR sectionals for the whole route and researched area airports. I took the online course on flying in the DC SFRA – my planned route would not take me within the 60nm radius where the course is required, but I figured it couldn’t hurt to know the procedures just in case. I also realized I needed to take more equipment with me than normal – tiedowns, a towbar, extra oil, some windshield cleaner, an iPad recharger, and of course the Stratus, not to mention backup paper approach plates and sectionals. Moreover, I needed to make sure the plane would have plenty of time left on it before it needed an inspection. I decided we would not make any hotel or rental car reservations ahead of time, since it was highly uncertain where and when we might be spending the night. Rather, I decided to plan stops at airports in relatively larger towns where we might reasonably expect to get a hotel room and rental car at the last minute. This turned out to be a very good decision with all the unexpected issues we faced on the trip. The original plan was to leave on July 1st. However, that day and the two that followed we had exceptionally bad weather – a high far over the Atlantic Ocean was affecting the whole East Coast with a lot of moisture and thunderstorms. The weather got progressively better each day, but even on Wednesday it was somewhat outside of my comfort zone. So, we delayed three whole days and finally left on the morning of Thursday, July 4th. The first leg was from Ithaca to Atlantic City – I chose that destination as it seemed a good place to reach the coast. For a coastal route to North Carolina, I needed to cross the New York-DC line at some point, with its associated busy airspace. Crossing it between NYC and Philly seemed as good a place as any. Plus Atlantic City seemed like a fun place to stop for lunch. I filed IFR to Atlantic City due to moderate cloud coverage. I got rerouted around Philadelphia airspace a couple of times, but nothing too drastic. I will say being rerouted in flight gets less stressful after the first few times you experience it. The first time you panic, the second time you find the presence of mind to ask for a vector to the first fix, and the third time you just roll your eyes, exclaim “ah, IFR in the Northeast”, and start inputting the waypoints into the 430, all while flying the plane safely in IMC :). Also, the Philadelphia Approach controllers were pretty relaxed – similar to my experiences with Boston. I think it’s really just NYC airspace that is so “unique” and provides “extreme fun” for VFR or IFR operations. In Atlantic City, we had a nice 4th of July lunch on the Boardwalk and then continued on to North Carolina. We flew down the coast all the way to Elizabeth City, NC, where the plan was to spend the night. Again I filed IFR; I have a strong preference for doing that for longer legs, particularly when the main purpose of the leg is to cover distance rather than to sightsee. I really appreciate not having to worry about dodging enroute clouds, plus being IFR provides much more peace of mind when flying near unfamiliar restricted airspace (of which there is a lot on the Delmarva peninsula!) . The flight was uneventful and we had very nice weather – this was probably the one IFR leg on the whole trip that could comfortably have been accomplished VFR. 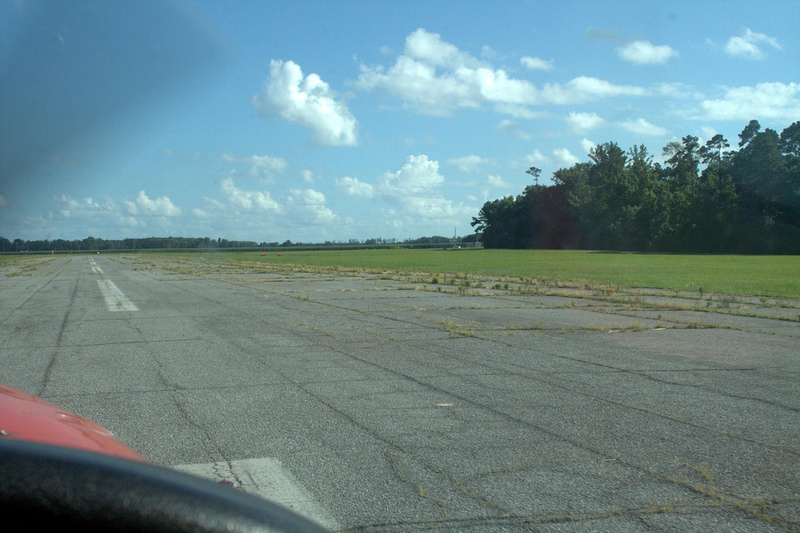 On the ground in Elizabeth City; can you tell this is not the principal runway at the airport? In Elizabeth City, the FBO was supposed to close at 5pm due to the July 4th holiday. Since we would arrive after that time, we were planning to tie down ourselves (I had called ahead and they told us to do that). However, it turned out one of the employees had to stay late and was able to help us. Elizabeth City has an interesting airport – it is a big Coastguard base with some unusual aircraft. 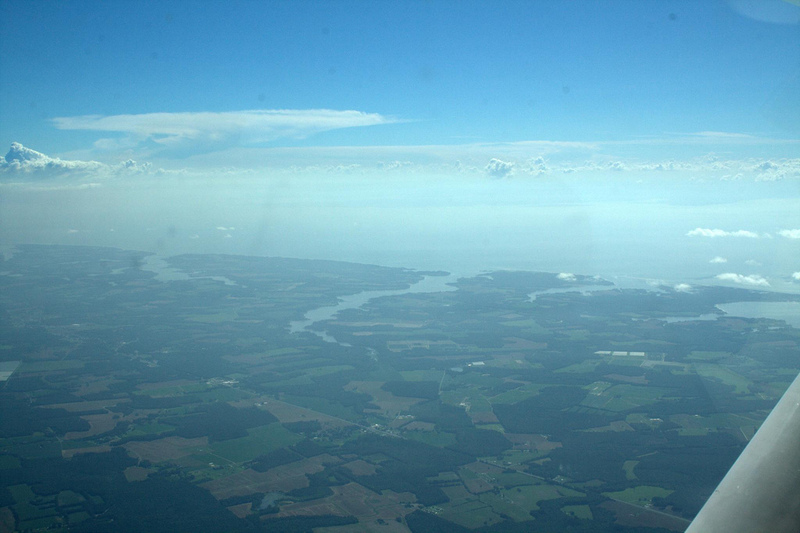 On the morning of July 5th, we departed Elizabeth City for a short VFR hop to our next destination – KFFA, or First Flight Airport at Kitty Hawk. It was a fun place to land, with a water tower on final requiring me to stay high and then slip the plane in to land. There was relatively little traffic and no wind, making landing pretty easy overall. We walked around and saw the monument and museum; it really was amazing to be able to land there. In fact, by coincidence, the plane I was flying (N66230) was the plane I did my Discovery Flight in, back in May 2010. It seemed fitting to be able to take it “back to the beginning”. After we saw the monument, I sat down in the nice air conditioned planning room and thought about what to do next. The ideal plan was to try flying down the Outer Banks, all the way to Wilmington. The main potential challenge was the large amount of restricted airspace in the area which you will see if you look at a VFR chart. However, I knew that if the restricted areas were cold (i.e. not in use), I could get permission to enter them from Cherry Point Approach. Plus, I knew I could make it at least to Beaufort (KMRH) without entering any restricted airspace if I stayed at the right altitude. So I decided to take off and aim for Beaufort. This was of course a VFR leg, and the weather was very good, with just a few small fair weather cumulus here and there. The restricted airspace turned out to be a total non-issue and Cherry Point Approach was very helpful. 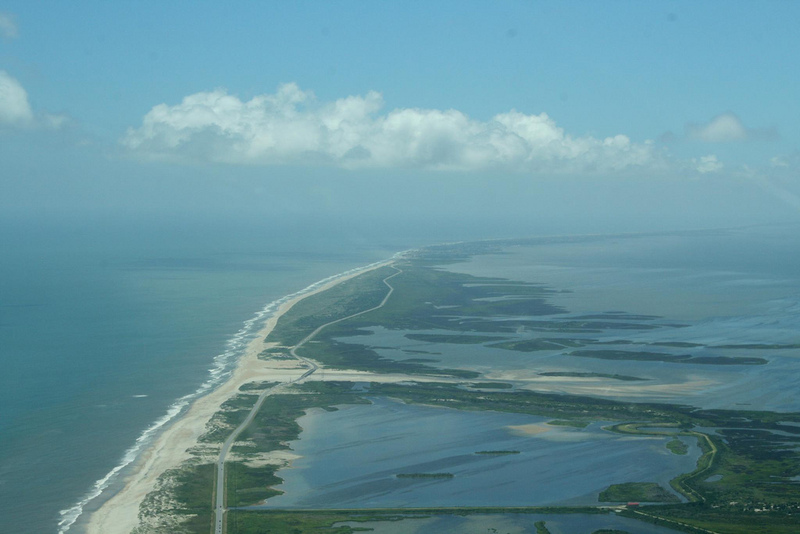 There was surprisingly little traffic – one other plane on the frequency (a Mooney) and one or two I saw taking off from the airports on the Outer Banks, but that was about it. All the restricted airspace was cold. 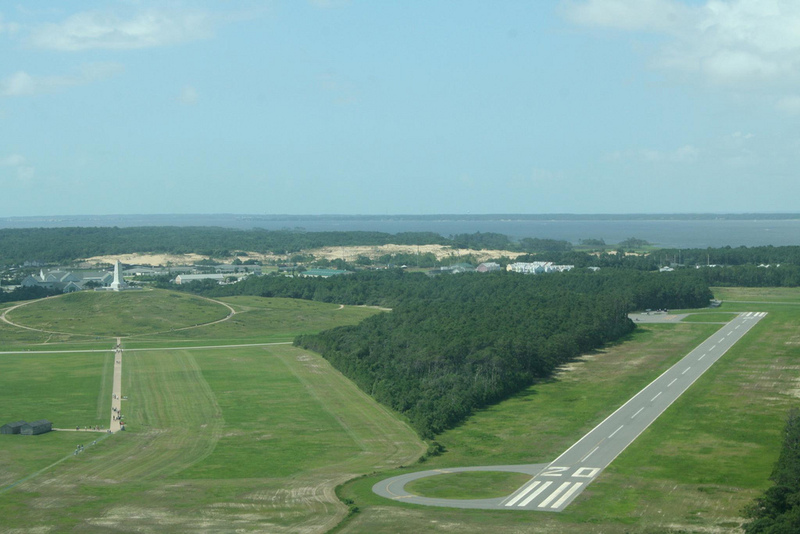 We had a very scenic flight all the way down the Outer Banks, past Hatteras, Ocracoke and many other interesting locations, and landed at Beaufort. 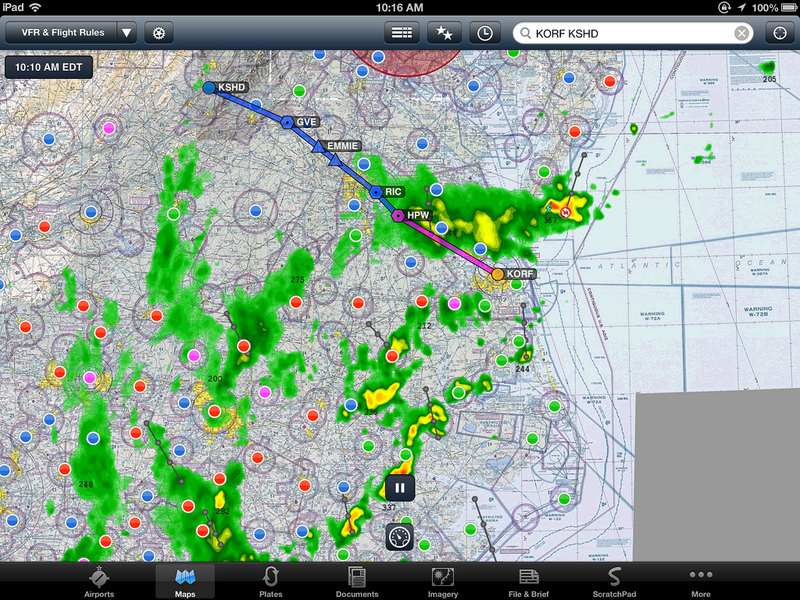 After a late lunch, we proceeded to Wilmington through more cold restricted airspace. 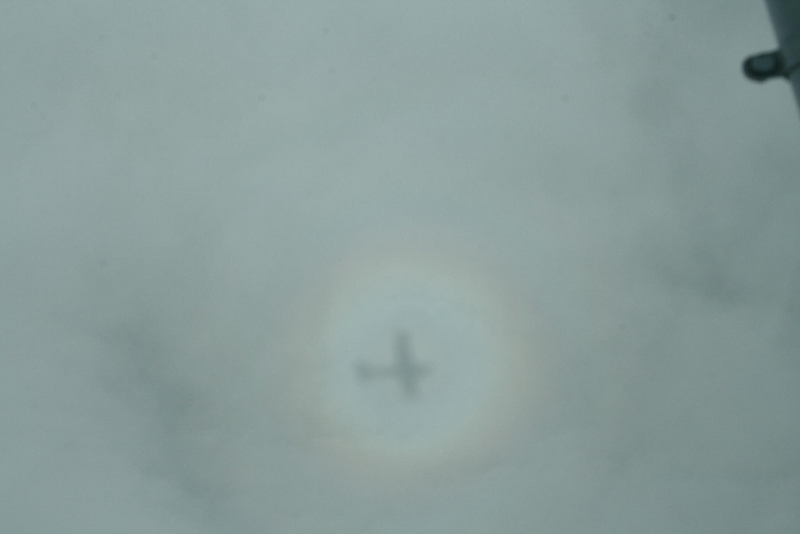 It was now later in the afternoon and the clouds were building, so I filed IFR for peace of mind and did not regret it. Doing this leg VFR would have required flying above a broken layer with very small holes for most of the trip, which is never a fun experience at least for me. We saw some thunderstorms far out to the west, but along our path there was no trouble. And then we were in Wilmington! It was great to hear the Approach and Tower controllers talking with North Carolina accents and know we were nearing familiar territory. We landed, rented a car and went to see our family! We spent three days in Wilmington on the ground, relaxing with family and friends and having a good time. The plan was to continue to Asheville on Tuesday July 9th, visit Biltmore and continue across the mountains to Knoxville on Wednesday morning. However, as they say, “no plan survives initial contact”. 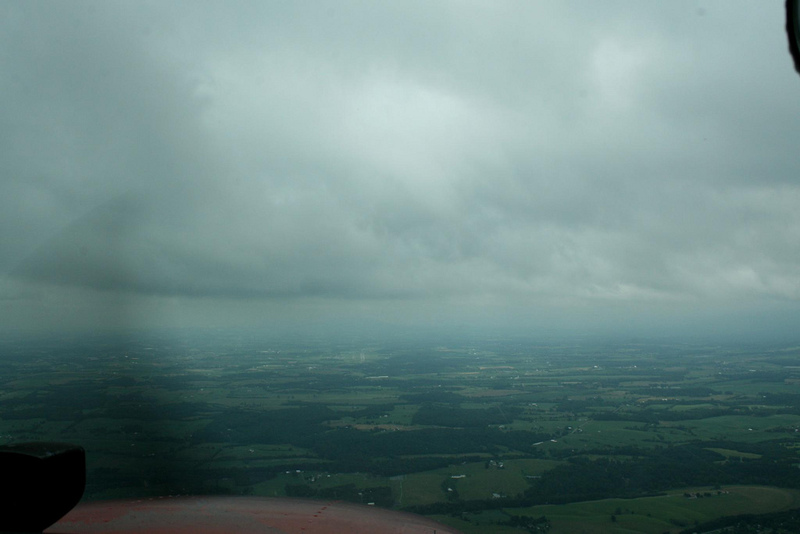 On Tuesday morning, we took off from Wilmington – again on an IFR flight plan, as the weather in the western half of North Carolina was IFR and slowly improving to MVFR. Everything was going well, with a scenic view on the climbout. Then, about 10 minutes after departure, an Interesting Thing (TM) happened. Looking at my instrument panel, I suddenly saw my heading indicator spin around 180 degrees by itself. This happened quite fast, as though the gyro had come “unstuck” from some attachment and swung around freely until it reached a blockage. It took me a few seconds to process what had happened; this was not something I had ever seen before. However, it was obvious to me that if your gyro is doing something you have never seen before, this is no time to continue into IMC. It didn’t look like a vacuum failure (the vacuum gauge and attitude indicator were fine), but I tried the Standby Vacuum anyway since it is a standard troubleshooting procedure. Nothing further happened to the heading indicator with the standby vacuum, but at that point it was clear to me I had a significant malfunction and needed to turn back. Obviously I knew to be very suspicious of both gyros since who knew what was going on. I called up Wilmington Approach, mentioned my problem, and told them I was turning back to Wilmington. They were extremely helpful, calm and professional – they verified that I did not need to declare an emergency (I said no, I didn’t), and provided vectors for a visual approach back into Wilmington. Throughout the episode, I was not frightened and we fortunately remained in VMC; it was more weird than scary, to be honest. 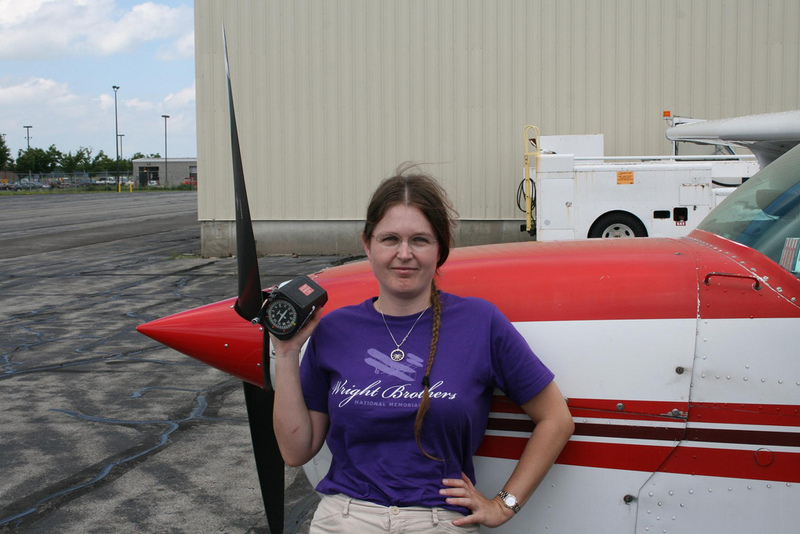 On the ground, we determined the gyro needed to be replaced; they didn’t have any available, so a replacement had to be sent overnight from Ithaca. 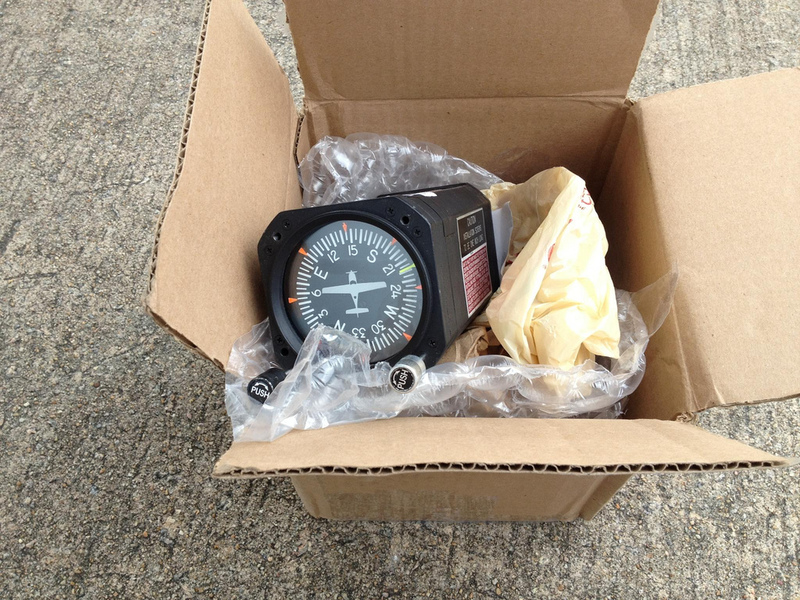 It arrived on Wednesday and it was installed on that day; I also test-flew the plane in the pattern with the new gyro. Wilmington Tower was very helpful. From what I was told by the locals, Wilmington ATC normally prefers not to have Skyhawks in the pattern due to significant airline and business jet traffic. However, when I told them I needed to do a test flight for a new instrument, they let me into the pattern no questions asked and generally seemed to give me priority over the arriving/departing traffic as I was going around. The faulty gyro delayed us for a couple of days. I didn’t want to try getting out of Wilmington and to Asheville on Wednesday afternoon; the plane was fixed but there were thunderstorms building along our route. We decided to depart on Thursday morning. However, we were now out of luck with the weather. A big cold front was coming eastward through the mountains on Thursday, and was scheduled to stall over coastal North Carolina and Virginia for days afterwards. This made getting into Asheville a risky proposition as we would have been flying directly towards the front, hoping to beat it to Asheville. Also, ahead of the front in Charlotte, there was already a big storm cell early in the morning. This was likely to complicate things in their busy Bravo (along my route of flight). So west didn’t look like the way to go. We could have continued south for further sightseeing in Georgia, which was very tempting. However, it seemed unlikely we would be able to get back north within any reasonable time frame after that. By the same argument, staying in Wilmington for a few more days was not a good idea either, as we would be just as stuck there. The only remaining thing to do was to turn back north now. The best place to go given the approaching front seemed to be Norfolk, Virginia. Again, I filed IFR though the forecasts seemed to suggest VFR conditions; I did not regret filing IFR, as most of the second half of the flight had to be accomplished above a solid overcast. This was also my first time receiving a long IFR clearance on the ground (rather than “as filed”), but with the help of the iPad I had no trouble figuring out where they wanted me to go. We were in Norfolk by lunchtime and then the thunderstorms set in. The following day was very rainy and stormy, as the front stalled and sat over us. This was one of these days where I felt that an experienced IFR pilot would probably have been able to get out, and I felt a bit frustrated at myself because I didn’t dare to go. However, I told myself that weather flying is one of these things where confidence comes only gradually through experience, just like flying in busy airspace. When I first got my licence, I wouldn’t have dared to go near a Bravo airspace by myself; by analogy, it was probably normal to be uncomfortable flying into truly bad weather just a month after receiving my instrument rating. Anyhow, we delayed and spent a day in Norfolk. The following day the weather was still not great, but at about 10am a gap opened allowing us to proceed northwest. I was a bit nervous, but decided to try getting to Shenandoah Valley Airport (KSHD). The distance was not too far and there was a number of good alternate airports right under my route, so a divert should be easy. I had the Stratus with me for on-board radar, and figured we had a shot at this. Long story short, we did make it to Shenandoah without running into any storm cells; the gap turned out to be rather large and allowed us to get through. There were still significant clouds along my route and KSHD was reporting around 2200 broken when I arrived. The Potomac Approach controller asked me what approach I wanted to use; I requested the ILS 5, since it seemed the safest bet. I flew the ILS approach, going through about 2000ft worth of clouds (vertically) on the descent. This was definitely a “real” instrument approach where I had to fly the plane in turbulent IMC while setting up the approach, identifying and intercepting the localizer, and handling ATC instructions all at the same time. While I was still IMC, the controller informed me he had lost me on the radar and requested that I report when I reached the outer marker. A couple of miles before I reached it, I broke out of the clouds around 2000 feet AGL, with the runway right ahead of me. Upon discussion with the controller I was comfortable canceling IFR in the air (KSHD is nontowered) and I landed safely. We spent the afternoon in the Shenandoah Valley; we rented a car and drove to see the amazing Luray Caverns. The next day, we were ready to head back to Ithaca. This would be the longest leg I had ever flown in my life (277 nautical miles straight line), but I knew I could do it. Again, I filed IFR due to the length of the leg and the proximity of DC airspace. I had a bit of “fun” picking up my IFR clearance. KSHD does not list a dedicated clearance frequency, so I asked the attendant at the FBO what the preferred local procedure was. He said I should be able to get Potomac Approach on the ground, if I was on the right spot on the airport. This worked, though I had to switch to the COM2 radio (sometimes these work better than the COM1s for some reason). I was cleared to Ithaca via the Shenandoah Two departure procedure, then direct. The procedure was interesting – who knew, you will have to intercept VOR radials even after you’re done with your IFR training! :-). But I had no trouble flying it and was soon en route. The remainder of the flight was easy, with only minor rerouting to keep me further from DC. And then we were back home! It was great to tune in to the Ithaca ATIS while still 50 miles out and hear a familiar voice. All in all, this was a great trip. My only regret is that we were not able to complete the mountain portion; due to the mechanical problem, we missed the weather window that would have allowed us to go west to Asheville. However, I am already planning a mountain trip for next summer to make up for that. The trip down the coast was still wonderful though. I gained a lot of experience flying IFR – not necessarily with very bad weather since I’m not willing to fly in that yet, but with clearances and routing and en-route confusion due to bad handoffs between controllers, etc. I also experienced and handled my first mechanical problem. I will say this trip could not have happened without an instrument rating, given the wet summer we are having. I logged 1.5 actual IMC on that trip, but that 1.5 made all the difference. Each of the legs of this trip was made much safer by the fact that I was on an IFR flight plan. As I said, the only IFR leg that could have been accomplished truly comfortably VFR was the leg from Atlantic City to Elizabeth City. To close, I would highly recommend that anyone who is tempted by a long cross-country trip should attempt one. It is really not as hard as you think, and while there are adventures it is also an incredible experience.